Sorrrrryyyy for the lack of updates! I still do some updates on my Facebook page cos it's easier for me to upload pics directly from my Iphone. Anyway! Lots of bridal nails I did recently and more to come. Interlace designs and simple flowers. This is super bling in real life! Everything blue and clear, with a dangling crystal charm and a huge solitaire ring art on the ring finger. Hehe. Light pink glitter nails with crystal bows. This is not a set of bridal nails but I thought some brides would love this if they want it simple. 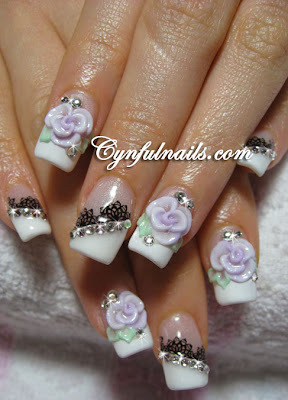 The french style nails with glitz and sweet cream bows. I always love these NA!! Hello !! I love all your design !! could you tell us if you lace is painted or stamped? I love the black one ^^ If it's a plate could you tell what trade mark and what number of plate please?